I know people always say things like this, but the weeks really feel like they’ve flown by. We’re over half way through and it’s starting to hit us that this is going to end quite soon. But it’s the tunnel at the end of the light, or something, because we’re having such a good time. We feel constantly fortunate to be doing this, and now we’ve picked up some pace we’re keen to keep powering through to the end. As you may have seen from the posts below this one, all three teams are having halfway-celebrating public events at the moment, and for James and I the Open House took place on Friday afternoon. 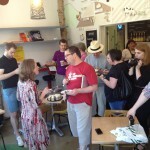 People began drifting in from a range of local and slightly more exotic arts and tech companies, there was free coffee, and the cake was not a lie. Caper‘s Katy Beale and the gallery directors Laura and Judith introduced us and we gave a talk about our aims – how we’re trying to help Site, why we’ve done the things we have, and what we think we might do next. There were then a lot of good questions from the crowd about things like artists and craftspeople and how we see our role within the organisation. People are naturally interested in what this level of tech and art collaboration can offer technologists, who could command much higher rates elsewhere. I think the benefits for the likes of James and I are obvious: we get to do some very exciting work with new prototypes (our Free Range printers are literally 001 and 002!) 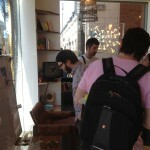 while putting the gallery in touch with a world of creativity it wouldn’t have much engagement with otherwise. Some people were even taking notes. It was extremely interesting and lovely, and we were particularly pleased to see our neighbours from Access Space, who stopped by to share their own experiences with drawing robots and have a go with my little ‘Minority Report’ Kinect photo swipey program thing. Oh yes, about that video. 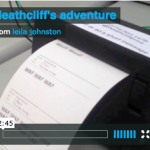 James and I made an ‘evidence’ film to show off our now-fully-mobile internet receipt printer Heathcliff having adventures around Sheffield last week, and we debuted this on Friday too. You can find pictures, words, videos and all sorts over on our project tumblr. Roll on part deux.